The bomb designed to be used at Trinity Site actually involved two explosions. First there would be a conventional explosion involving the TNT and then, a fraction of a second later, the nuclear explosion, if a chain reaction was maintained. The scientists were sure the TNT would explode, but were initially unsure of the plutonium. If the chain reaction failed to occur, the TNT would blow the very rare and dangerous plutonium all over the countryside. Because of this possibility, Jumbo was designed and built in Ohio. Originally it was 25 feet long, 10 feet in diameter and weighed 214 tons. Scientists were planning to put the bomb in this huge steel jug because it could contain the TNT explosion if the chain reaction failed to materialize. This would prevent the plutonium from being lost. If the explosion occurred as planned, Jumbo would be vaporized. 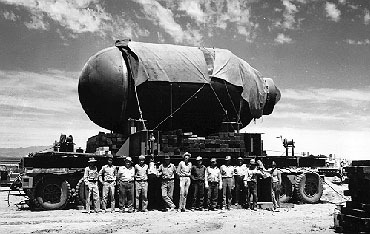 ...) As confidence in the plutonium bomb design grew it was decided not to use Jumbo. Instead, it was placed under a steel tower about 800 yards from ground zero. The blast destroyed the tower, but Jumbo survived intact. "The heat was like opening up an oven door, even at 10 miles." Dr. Phillip Morrison said, "Suddenly, not only was there a bright light but where we were, 10 miles away, there was the heat of the sun on our faces ..... Then, only minutes later, the real sun rose and again you felt the same heat to the face from the sunrise. So we saw two sunrises." Although no information on the test was released until after the atomic bomb was used as a weapon against Japan, people in New Mexico knew something had happened. The shock broke windows 120 miles away and was felt by many at least 160 miles away. Army officials simply stated that a munitions storage area had accidently exploded at the Alamogordo Bombing Range.